"You need to send out an email about dates!" Karen called through from the kitchen. "What dates?" I called back from the front room, whilst surreptitiously munching on a delicious fairtrade ginger biscuit and pondering on the possibility of spending a week in a bath full of fairtrade muesli for charity. 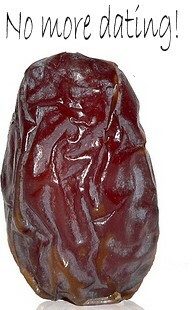 "You mean the oblong fleshy fruits of the date palm? Are they on special offer then at the Mustard Seed?" "No - dates. You know - DATES. The dates during Fairtrade Fortnight!" "Ah yes - right!" I called back - trying to disguise the mouthful of biscuit - "Dates? - Like going out on dates - and dating sites? To meet other fairtrade supporters you mean?" . It sounded bonkers to me. I pondered on whether the bath full of muesli would be better dry - or with milk . "NO - DATES. Diary Dates!" she called out - volume and pitch both significantly up. "Like the Fairtrade market stall next Tuesday! 1st March - that kind of date!" It was probably better dry - because then you could simply put it back in the packets again afterwards and sell it. Maybe at a discount. And the milk would probably go off anyway. And - what was that Karen was saying about dairy dates? At this point Karen marched in and thrust a sheet of paper into my biscuit hand, dragging me out of my milky reveries. "Look - just type this in and send it off" . "OK ". I put the rest of the biscuit in my mouth. Thursday 3rd March: Meeting with Palestinian Farmers - Fairtrade olive producers . 7.30pm - Catholic Church. All welcome - should be very interesting! Saturday 5th March: Fairtrade Bunting World Record Attempt! 9.30-11.30am under Old Town Hall. Come & Decorate your own bunting flag! Saturday 5th March: Fairtrade Sale at the Shrivenham Methodist Church Coffee Shop. 10-11.30am . All welcome. Sunday 6th March: Fairtrade Sale & Big Brew Hot drinks in the Catholic Church Hall in Faringdon. 10am-11am . All welcome . Sunday 6th March: Fairtrade Sale at St Nicholas Fyfield. 10.30am (after village service) . All welcome. Tuesday 8th March: Fairtrade Pancake Feast at the Shrivenham Methodist Church. 10am-12midday . All welcome. Sunday 13th March: Fairtrade Sale at St Mary's Buckland - after the Morning Service. All welcome. Saturday 19th March: Fairtrade Sale at St Denys' Stanford in the Vale. 10am-12midday. All welcome. "Gosh - what a lot going on!" I commented - noting that there would be lots of milk required for the Pancake feast. "Can you cope yeah ?" "Cornucopia? Hmmm" ... Karen mused - "Interesting choice of word. A cornucopia of fairtrade events ..."
And I was thinking of Nomads in the desert getting all of their dietary requirements just from milk & dates. P.S. 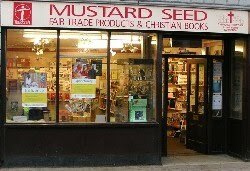 Look out for the discounted muesli in the Mustard Seed in the Spring . A Placebo (latin: I shall please) is a fake medical intervention (for example an inert pill) that is administered as part of the control in medical trials, and very often turns out to be remarkably effective; sometimes even better than the real thing. This is known as the Placebo Effect. Drug companies don't like the Placebo effect, because there's little profit in sugar pills. But it sure saves the patient a lot of money. So we decided to test out whether or not the placebo effect also works with fairtrade. Do we really HAVE to pay this fairtrade premium to farmers - or would a placebo work just as well? Well - come on - be honest - have YOU spotted that I wear a fake Rolex - and that it only tells the right time twice a day? Step Two: We then chose a load of dorky friends on their gap yah - with their smartphone video cameras - to go to the interesting places on the map (all of them) & record what happened next. Step Three: We bought a load of stuff (tea, coffee, sugar, handicrafts, cocoa, honey, dried fruits, fresh fruits, nuts - and so on) from all these places and of course paid as little as possible for it . Definitely no premium. Step Four: (Here's the clever bit) . We then stuck little fake fairtrade logos on all the cheap stuff ; took it down the Mustard Seed; texted the dorky friends to start filming in their far flung places (at least - those that had remembered their chargers) ; and then sold off all the stuff - fake logos an' all (and at full price of course - we didn't want the customers to suspect anything) to the gullible bleeding heart liberals who came into the shop. And the customers never knew the difference; they didn't know they were getting a placebo product - clever huh? But - (on this occasion at least) - the placebo effect didn't kick in at all. However much we sold of the cheapo placebo stuff , it didn't make a jot of difference to the poor farmers. The videos ( Android & iPhone in equal measure) showed clearly that the farmers & their families stayed poor. Very poor. In fact, they got poorer. We even tried sticking on more fake stickers: but that didn't work either. So : we have to conclude therefore that the products we buy HAVE to be the real thing if they're going to help the farmers & their families. They have to be properly certified as fairtrade or fairly traded. 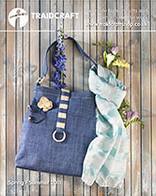 And therefore, isn't it just dandy that the new Traidcraft Spring catalogue has just come out: and is available for you to pick up from the Mustard Seed? And - in the catalogue there's also a very interesting article about the Nocebo Effect (available to read for anyone with the latest android augmented-reality Z-Axis eBook reader+3D specs ) . What's the Nocebo Effect - I hear you ask? (Bionic hearing.... ) Well, patients on placebos often suffer side effects and adverse reactions - even though they're just getting a harmless Placebo. Hence the Nocebo (latin: I will harm) Effect . The same happens with fake fairtrade. When we buy all the placebo stuff in ordinary supermarkets, we think nothing of it. But <because of that Nocebo Effect?> there's lots of nasty side effects & adverse reactions that we aren't aware of . Those gap yah smartphone videos show clearly that the poor farmers & their families really suffer when we buy placebo. In this case, it's got to be the real medicine. No sugar pills - unless they're fairtrade of course. At the BAFTAs tonight, the 181 guests will each receive a £2500 goody bag full of freebees, and - not being one to miss a marketing trick - I DID phone the organisers offering a contribution from the Mustard Seed. Bizarrely - they (well, Jonathan Ross actually) turned down my offer of recycled-paper kitchen rolls and biodegradable kitchen caddy bags. Instead, they have opted for limited edition Anya Hindmarch designer bags, Grey Goose vodka, Taittinger champagne, Escada scarf, Lancôme beauty creams, Cocorose ballet pumps, and a gold iPhone cover. 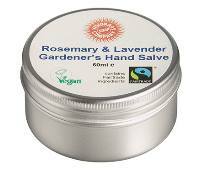 "But the Fairtrade Rosemary & Lavender Gardener's Hand Salve is brilliant!" I insisted. "Much better than that Lancôme stuff. And it doesn't even need a circumflex to work." I think he must have been put off by the yuck factor of the recycling of kitchen rolls, because my plaintive " ...but it's SO much more sustainable and with a MUCH lower carbon footprint!" was lost in the ether of a phone line that had gone dead. It was no more. It was pushing up the daisies. An EX-phoneline. Suddenly - the image of a Norwegian Blue pining for the fjords came into my head. No idea why. Rather apprehensively - I then called Colin Firth. "Ap-p-pologies. I'm c-c-alling about t-t-tonight... " - I stammered - the nerves getting the better of me. There were barely suppressed chuckles at the other end of the line. "Very funny - King's Speech an' all that! So - how DO you get a drink out of a Vogon then? " It was my turn to laugh - even though I didn't have a CLUE what he was on about (until I looked it up on Google later and found the reference to the Hitchhiker's Guide & the meanest species in the universe: < you put a finger down his throat> ) . Anyway - ice broken - I explained how we are trying to banish UNfair trade etc etc . I had him cornered. He interrupted me - thank goodness - or I might have verbally bludgeoned him into a quivering pulp. Not much use when you're trying to climb those stairs up to the Podium. "Look" - he said. "We can easily ... "
"Wikinisli " I asked - "is that like Wikileaks & Wikipedia ? " He continued. "We can easily - if I win tonight - change my surname from Firth to Fairtrade . Sound good? Colin Fairtrade. " I said that wasn't enough. Nowhere near enough. "OK. When I get up to the podium - instead of the usual mother-thanking stuff - I can do a Mustard Seed Speech - like the King's Speech. What do you think? Just send me the text. " I was speechless. Well - you know what I mean. This sounded like - hmmm - like Colin Firth. Anyway. Here's what I sent him. The M<y bonnie lies over the ocean!>ustard S<£$%%! !>eed P<ining for the fjords!>romotes the Christian F<aringdon is fantabulous!>aith and H<old on to your horses Hermione!>ighlights the P<eter piper picked a piece of pickled pepper>rinciples of F<!£$***%>air T<o Buy fairtrade or Not to buy Fairtrade - that is the Question!>rade through the S<sells seashells on the sea shore>ale of C<hristmas is only 312 days away!>hristian literature and F<ine time to buy from the Mustard Seed!>airly T<urn again Tony!>raded G<**&^%$>oods. It's F<airly traded>antastic and WE ALL SUPPORT IT! Amazingly - when he read it back to me on the phone he didn't stammer once. So - let's hope he wins. 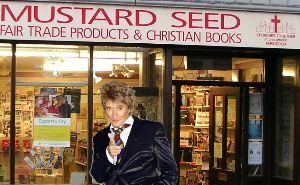 As you can see from the photo on the right, Rod Stewart happened to pop in to the Mustard Seed the other day - on his way to Wembley (I think he may have been lost). "This shop rocks man - Yeah! " he throated - in his characteristically gravelly voice. "Did you know that Sinepiseemned is the Estonian for Mustard Seed? " "And this stuff is good enough to eat!" - he said, picking up a bottle of the new Guatamalan squeezy honey. "Perfect for porridge! " "I see you have a SALE on? Need a hand to shift the merchandise? " he grated. Well - rather tentatively - I suggested he might like to write a song that we could perhaps use in our marketing. His reaction was pure Rod.
" Yeah man - Wembley can wait! Your SALE comes first! " To release them, from poverty! And then - right there - he picked up his air guitar - and launched into song. Fantastic! Especially the solo guitar work . "That could be a hit - possibly " I said carefully . "Or - would it work better in Estonian?" he replied - extracting another handful of gravel from the back of his throat. "By the way - D'you need your driveway doing?" At which point, his stretch limo took out another bollard whilst trying to negotiate the right hand turn round the marketplace. Anyway - LOSE the thought of the bollard - that really isn't relevant to this email. It's the Sinepiseemned SALE that's the news here (Sorry - been around Rod too much - I keep dropping Estonian into the conversation) . Yes - as Rod played so beautifully on his air guitar (you had to be there) it's SALE time at the Sinepiseemned! So - to cut a long email short - Pop in to the Sinepiseemned to P-P-P-Pick up a Penguin (well - blue elephant that looks a bit like a penguin anyway ) . And there's lots & lots & lots lots & lots & lots of other BEAUTIFUL items reduced! (For the vegetarians amongst us, some of them aren't even animals ) . 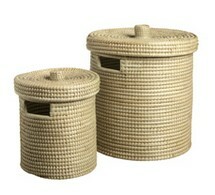 "Wow - those baskets would be great for putting grandchildren in!" "And did you know that trawets dor is Rod Stewart backwards ? " - Rod asked on his way out.